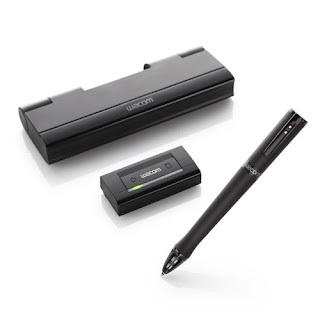 Wacom has just announced a digital sketch pen that will allow you to capture what you draw or write on any piece of paper in digital form, "stroke by stroke". The new product named Inkling is comprised of the hardware and a software. 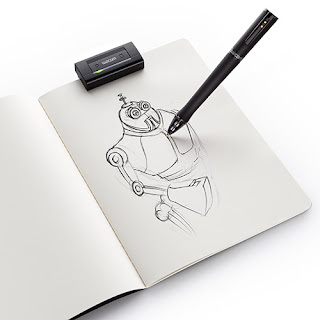 The hardware include the pen and a receiver that will capture your sketch and then store it digitally, Clip the receiver on the edge of a piece of paper and adjust it to make sure it has a direct line of sight with the pen, you're ready to go. When you're finished sketching, just connect the receiver through the USB to transfer your files. Files are opened with the proprietary software from Wacom to edit, delete or use layers on your sketch. However, you can also store your files in JPEG, TIFF, BMP or PDF and then open with software that supports these formats. The Inkling can store thousands of your sketches. You can also use the included software to export your files to Adobe Photoshop or Illustrator to refine your sketches even more. I love sketching and doodling so I am very interested with this product. It will come out in mid-September in the US and will be priced at US$199.